Theresa May has hailed the "heroism" of the suffragettes as her Government faced calls to pardon women who were treated as criminals for fighting for the right to vote 100 years ago. Labour leader Jeremy Corbyn and Scottish Conservative leader Ruth Davidson are among those leading calls for pardons. Home Secretary Amber Rudd has said it would be "complicated" to do so but she would "look at" the proposals. 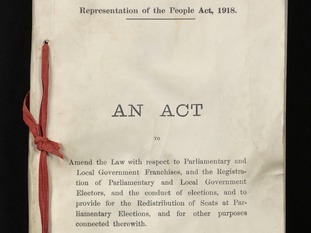 It comes on the centenary of the passing of the Representation of the People Act, which granted the vote to many women aged over 30 who met certain property qualifications. The fight for women's suffrage was led by women made famous by their daring stunts, law-breaking and non-violent forms of protest, including Emmeline Pankhurst, Emily Davison and Flora Drummond. SNP leader Nicola Sturgeon has announced a £500,000 fund to drive greater representation of women in Scottish politics in "tribute" to the suffragettes. Events have been held across the country to mark the centenary. On Tuesday evening, the Prime Minister addressed a reception in Parliament to launch a year-long Vote 100 programme of events to celebrate a century of female suffrage. 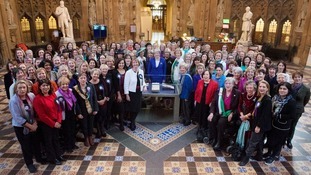 All female MPs past and present were invited, in what is expected to be the largest gathering of the UK's women politicians ever organised. In her speech, Mrs May praised the "heroic, tireless struggle" of the suffragettes, adding that the right to vote "was not handed over willingly". The Prime Minister also made a pledge to victims of domestic abuse, many of who are disenfranchised because they fear revealing their address on the electoral role, something they will be able to do anonymously in the future, she said. Labour's shadow cabinet met at the Museum of London, currently home to an exhibition on the suffragettes. Mr Corbyn told his top team that the convictions of suffragettes "were politically motivated and bore no relation to the acts committed". He said: "Labour in government will both pardon the suffragettes and give an official apology for the miscarriages of justice and wider persecution they suffered." Ms Rudd said the issue was "complicated" when looking at cases of arson and violence, but promised to analyse individual proposals. "I'm just pointing out, unfortunately, the practical reality of bypassing the law in this way, but as I said, I would like to take a look at individual proposals to see what can be done," she told BBC Radio 4's Today programme. Britain still has "a long way to go" to achieve true gender equality almost 100 years on from women winning the right to vote, three generations of women told ITV News. They said "significant" strides had been made but more needs to be done, with gender pay gaps and pregnancy discrimination still existing much like they did a century ago. But they told ITV News that the legacy of Emmeline Pankhurst lives on and continues to inspire many people. ITV News was given access to some of Parliament's artwork and artefacts which hold special ties to the suffragette movement. They show the sacrifice that women went through as activists, including a hunger strike medal awarded to Caroline Downing and bolt clippers used to cut the chains of protesting women.